to give you an idea of how dirty i was… i didn´t even bother to take my shoes off when i took a shower just now. i think i am ready to talk about carnaval. i feel like i´ve ridden the bull and can tell the tale. today i feel like a survivor. at the same time, telling it is like reliving it and i suddenly feel exhausted. carnaval started on thursday last week. (thursday and friday were work days, monday and tuesday are holidays.) today is sunday. i´ve gotten a bit of carnaval every day and each day has been a little different. 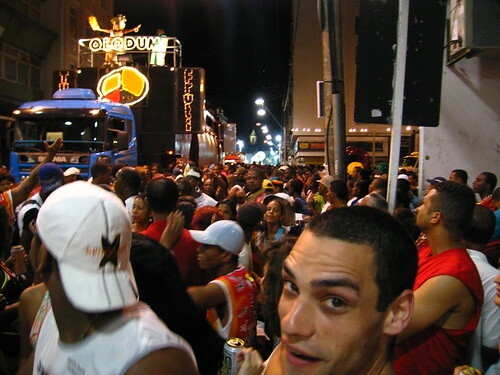 first of all, salvador has three carnaval parade routes. our apartment is centrally located, two blocks from the thick of it though it sounds like its below my window. thursday, friday, saturday… progressively fun. the ultimate street party. thursday was just a preview. we bought some beers and got acquainted with the way things work. there is a mac truck covered with speakers and topped with a band. there are hired hands to that carry a rope barrier around the truck. this is the party space for people who paid to be in there. they are identifiable by costume which the buyer alters for personal flare. then a support truck, another mac, follows. its equipped with bathrooms and beer. the whole roped affair is called a “bloco.” people pay anywhere between $40 – $400 USD depending on the band playing on top to hang out within the rope. its supposed to be safer within. i doubt it. i´ve concluded that paying to be in a bloco is a big waste of money. its great when groups of people make their own costumes cause that´s really the fun of it. well… let me retract that claim. tonight was a city wide mosh pit of 2 million people. there is nowhere to go for relief. not even within the roped blocos. thank god its been raining to keep the temperature bearable. So, this is what you are doing while I’m looking up the finer details of cashews and their pseudo fruitsI The only thing making me ok now is that I know that you made it home to your computer to write this journal for us. We need a skype call from you, dearie! Doesn’t sound that bad. Who is Eric Marc Crawford? Well well Miss Erica. Sounds like you’ve got more to tell but could it get any crazier? Yea ,I’m glad you made it through all that ..hope you’re all cleaned up now. It’s a ONCE in a life time experience, right? Take care. STAY SAFE and not alone. We all miss you. p.s. you’re always in the circle.